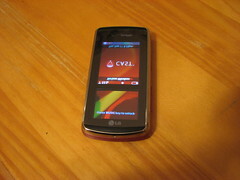 In May my wife got a new LG Venus through Verizon Wireless. She liked the slider, and the touch screen, and I'm sure the pink color didn't hurt anything. The phone worked great for her until the middle of August, at which point the phone separated into two pieces. We called Verizon and since the phone was under the 1 year warranty, they sent us out another phone. The new arrived in 2 days, and we were able to activate it and get Backup Assistant on it without any trouble. My wife starting using the phone and within 10 minutes sections of the screens would go white and thus be unreadable. The phone would also lockup and the battery would have to be pulled in order to temporarily fix it. I placed another call to Verizon and learned that phones they send out for warranty replacements are refurbished, so occasionally they do have problems. They spent about 30 minutes or so trouble shooting, then agreed to send her yet another phone. Again, in two days, we received the phone, activated it, loaded it with her contacts through Backup Assistant, and she started using it. 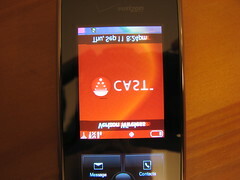 Within a few hours the phone did something very crazy, it flipped the main screen upside down, and mirrored it left to right. It also stopped receiving phone calls or text messages. I called Verizon again, and spent over 2 hours of the phone with them doing trouble shooting stuff. Eventually they agreed the phone was junk. They offered to give us any phone we wanted, brand new, up to the value of the Venus. So the real question is... is the Venus a bad phone? Or is the warranty service through Verizon just so bad they send out junk refurbished phones and hope customers won't complain? I myself cannot recommend this phone. My wife went through 3 and they all were defective. As you can see my the video and by my post, we simply had no luck with this phone. I don't know weather to get the LG Venus cellphone so i was wondering if you could tell me weather to get or not. I guess your story is one of the reason behind this free offer. I just hope the phones won't be defective ... it would be such a ruin to their name if they would do that.